It’s early in the season and you have likely signed up for your big event and hired a coach to help you meet your goals. To make sure you get the very best from your coaching experience, there are a few critical things you need to provide as an athlete. The most important being clear and consistent communication. Use the following tips to give your coach the right information they need. Communicating with your coach sounds easy, right? But the truth is, lack of communication between an athlete and coach is likely the number one reason that athletes don’t benefit fully from coaching. Before coaching ever begins, there will typically be an initial meeting or phone call. This contact is the first and best opportunity to set some expectations around what you will need as an athlete. As a coach, I always ask an athlete this question at every first contact, “What would a successful coaching experience look like for you?” Be prepared to answer that question in detail. The first contact is also an opportunity to communicate your expectations, not only around coaching, but also your race goals and any limitations to your training such as your family, job, injuries, etc. As online coaching becomes the new normal, location is no longer a limitation. 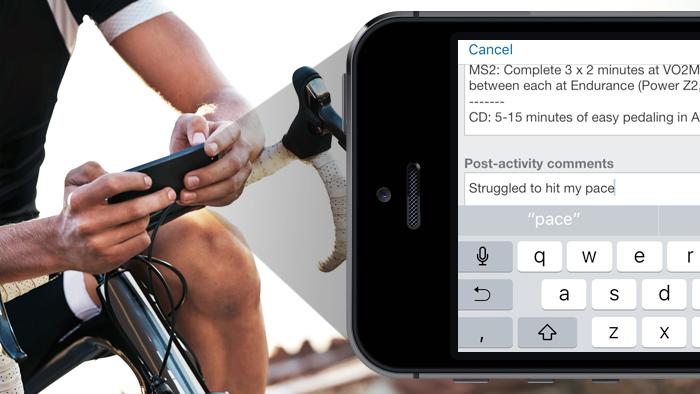 A majority of the coach-athlete interaction will take place through e-mail, telephone calls, text messaging, and notifications within TrainingPeaks. Be clear with your coach regarding what you prefer in the area of communication frequency and method. Otherwise, he or she may assume everything is going fine and you have no questions. Just make sure you let your coach know what you need, and make use of all available technology such as Skype or Facetime. You want to get credit for your hard work, right? It cannot be over-emphasized how important it is to upload your workouts frequently, and to leave your coach post workout comments. This lets your coach know what you are doing, how your body is responding to the training load, and how you are progressing with your program. Thankfully, many devices now automatically upload directly to TrainingPeaks. I happen to coach using TrainingPeaks, and when one of my athletes completes and uploads a workout, I immediately receive an e-mail. This gives me an opportunity to review the workout file and give feedback. I can even do this from my mobile device when I’m on the go. It is also good to log in metrics like weight, sleep, and hydration. This can also be done easily via TrainingPeaks, and gives your coach a fuller picture of your overall health. Seeing a few nights of low sleep and poor hydration will inform your coach and help them create a more detailed plan for you. In addition to uploading data, you need to let your coach know how you are feeling. You may complete a workout as planned, but a comment like, “Felt great” is very different from, “Struggled to hit my pace”. Let your coach know how the session went, and why you felt it was a success via the Post Workout Notifications or in an email. These comments let your coach know how you are feeling so they can adjust your schedule if need be. Letting your coach now when you’ve missed a workout, for any reason, is one of the biggest keys to getting the most from your coach. As life sometimes gets in the way, we all have to miss or cut a workout short from time to time– even your coach! However, if your coach doesn’t know why you missed the workout they can’t make the proper adjustments. If you missed the workout due due to work or family commitments, the best step is often to just move forward. However, if you are getting sick, or feel a small injury coming on, your coach will want to address that and change your schedule. If your coach isn’t able to make it to your races, make sure to let them know right away how your race went. It is also helpful to schedule a phone call in the weeks following the event to debrief. I also recommend athletes write a race report for their most important events. While these do take some time, I find that it is a great way for the athlete to reflect on the race, and if you post these online, it can help other athletes who might be preparing for that same event in the future. Dollar for dollar, hiring a coach can be one of the best things you can do to progress in your sport– more than any piece of equipment or electronic gadget. The deal is that you pay a coach for guidance, support, and accountability. The accountability is shared and both you and your coach have a part to play to make it work. Are you currently searching for a coach? Let the TrainingPeaks Coach Match Service find the perfect coach for you.